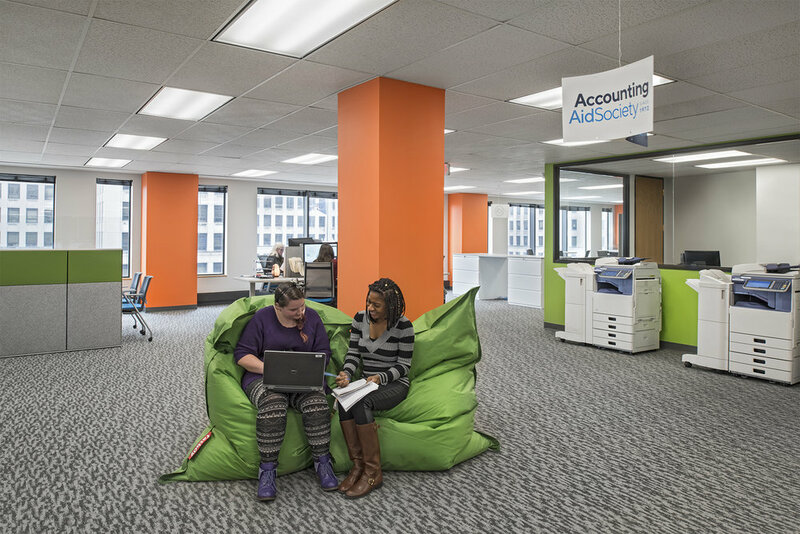 Accounting Aid Society is a Detroit-based non-profit aiming to improve the lives of low income individuals and small business owners by empowering them to understand their taxes. Their services have returned over $375 million in tax refunds to individuals and small businesses in Wayne, Oakland, Macomb and Livingston counties. This ‘Best Managed Non-Profit’ was moving buildings and wanted to update their current furniture to something that better displays their culture and values. The new building held some unique challenges including ensuring that ADA accommodations were made for employees and client’s in wheelchairs as well as ensuring that noise and privacy is kept under control in the open environment. Open up the space with an open floorplan that will encourage collaboration and spread daylight views yet provides enough privacy for clients discussing sensitive matters. Various types of workstations for the different levels of workers including volunteers, employees, managers and leadership. Being a non-profit; the furniture budget needed to stay lean. 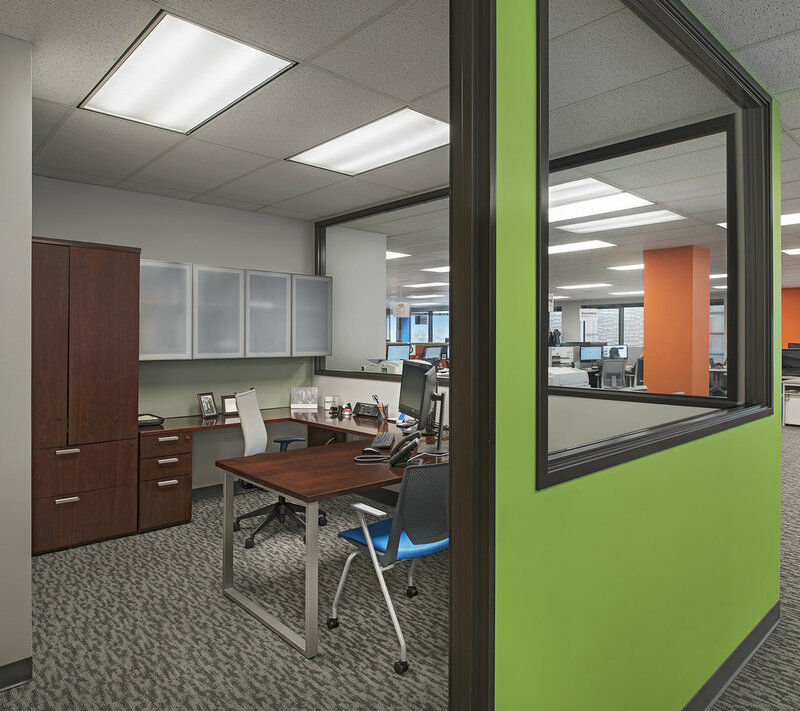 We were able to provide a cost effect solution seamlessly fusing multiple brands and both new and used furniture to best fit the space, style and budget of the organization. Panels with frame-less glass allow everyone to take advantage of the beautiful downtown Detroit views. Multiple workstations were used to accommodate the hierarchical organization including benching for volunteers and workstations with additional seating for managers. Sound masking provides noise control throughout the space. Bright color scheme provides cheery, inspirational colors that were a group effort. Aligning with their value of being transparent, AAS used this opportunity to involve their team in the color scheme choice. This allowed everyone to feel included and engaged. Spaces and seating, including the café, file islands and fun bean-bag chairs encourage collaboration and informal meetings.